We've decided to start stocking a few items that are not directly bike related, but that we've used and really like. Among them are classic French Opinel pocket knives. Inexpensive, lightweight, and made from superb steel, they are the standard knife of French farmers, hikers, foragers and cyclo-tourists. In fact almost everyone who spends time in the countryside seems to have one. They've been made since 1890 in the town of Saint-Jean-de-Maurienne in the Rhône-Alpes. I've used Opinel knives since I was a boy. I love the simple rotating ring that locks the blade either open or closed. 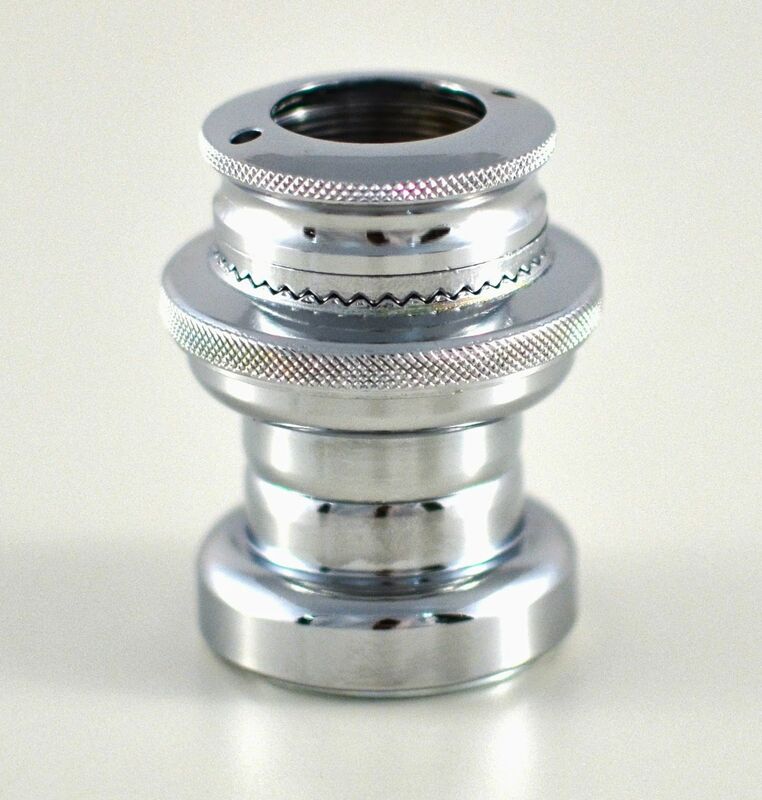 There is no need for a spring because of the lock ring. The handle is beech, a light but tough wood. 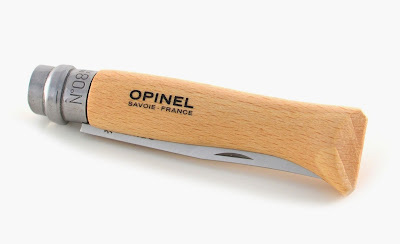 This makes Opinel knives quite light and great for cyclists and hikers. They are available with either carbon steel or stainless steel blades and in a number of sizes. The #8 (8 cm blade) is considered the standard and most versatile size. Like most traditionalists, I prefer the #8 carbon blade version. The carbon blade can rust if not wiped after use, but it develops a beautiful patina. The carbon blade is also easier to sharpen and takes a better edge--experts compare it to blades costing 10-times more. The stainless steel blade is rust-proof and stays shiny, and the edge sharpness is very very close to that of the carbon version. We also stock the #10 knife (10cm blade) with corkscrew. The larger size is required to house the corkscrew. 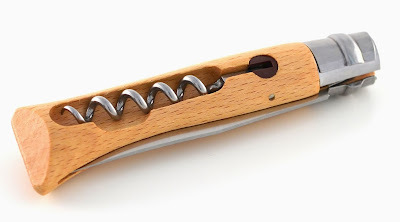 Now the French do know a thing or two about opening wine, and the corkscrew is the same large French model as used in many far more expensive wine openers. The blade is stainless and perfect for spreading cheese and pate, as well as for more workman-like tasks. 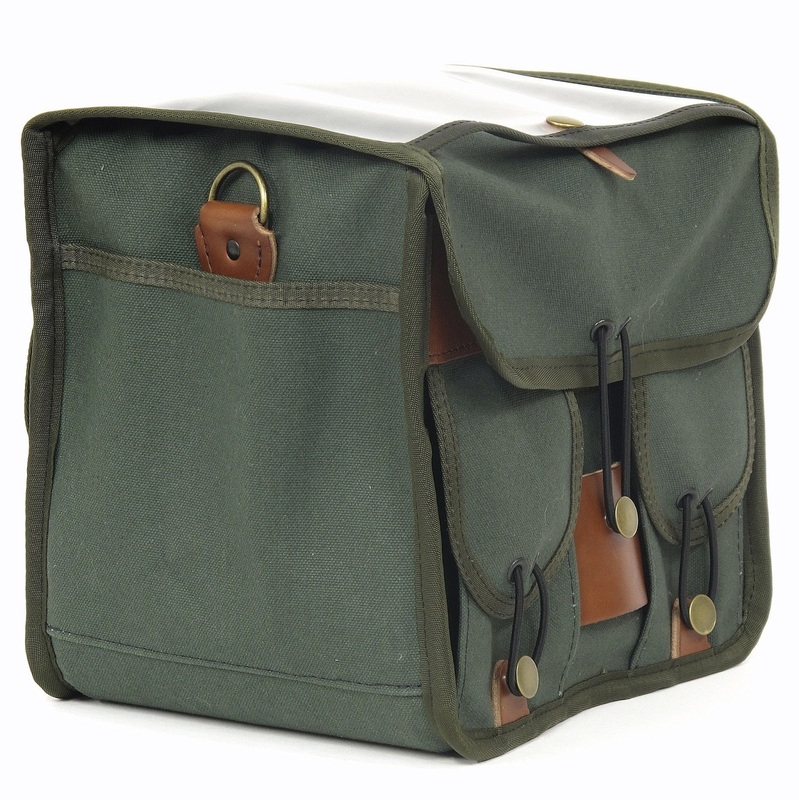 It's size is best for a picnic basket or handlebar bag, rather than pocket. In 1985 the Victoria and Albert Museum in London selected the Opinel as part of an exhibit celebrating the “100 most beautiful products in the world”, featuring the Opinel alongside the Porsche 911 sports car and the Rolex watch. The Opinel was also selected as one of the 999 classic designs in Phaidon Design Classics, and has been exhibited by the New York's Museum of Modern Art (MOMA) as a design masterpiece. We just got a new prototype of the crazy bars that I talked about a little over a month ago. I've been riding around on the original prototype since their arrival and I couldn't be happier with their functionality. This new prototype is functionally the same as the original prototype, we just think that it is a little more aesthetically pleasing. What do you think? Just received out first shipment of Grand Cru Rinko Headsets. Rinko is a form of touring cycling that's popular in Japan. It involves travelling on a train with your bike in order to reach a cycling destination. 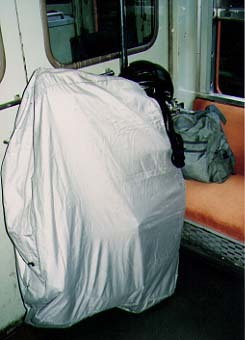 If the bike's wheels and fork are removed and all is placed in a lightweight nylon bag, the bag can go as regular luggage in the train's passenger compartment. I first wrote about rinko here. But quickly removing the wheels and fork is a simple way to pack a bike for car or plane travel as well. And a lot less expensive than couplers. Our rinko headset was developed in conjunction with M's-Bicyclette of Japan. It's primarily for the Japanese market, but we have some in stock here for other customers. I wonder if this would work for Amtrack? Would they allow a bike in a rinko bag as regular luggage? This what happens when we have too much free time. It's a Grand Cru 50.4bcd crank set up with four chainrings. In this case it's a twin half-step. This may have possibilities, instead of running a 1x5 on your city bike, you could run a 4x1. Or how about a 4x11--so many gears? Boggles the mind. 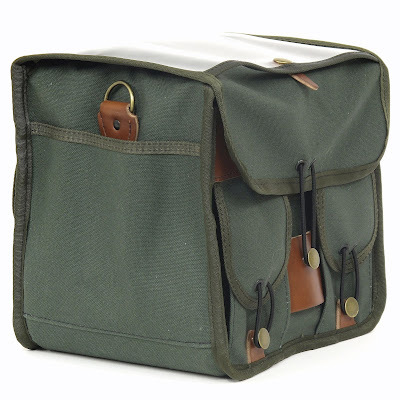 In other news: We have the Maryland made Grand Cru handlebar bags in stock again. The first production run sold out fast. We also have these cool stickers. You'll get one free with every order, and you can order extras. The VO Campeur got a great review in the July issue of Adventure Cyclist. It was written by Charles Pelkey, a very experienced touring cyclist and former senior editor at VeloNews. Unfortunately there isn't an on-line version of the article yet, so I'll type out a few short quotes below. "...It's a bike that reflects a thoughtful, even joyful approach to design." " Fully loaded, the bike tracks beautifully." "...I hit a downhill stretch where, when I last rode it fully loaded, the bike I was on shimmied unmercifully. No such problem with the Campeur." "...It's simply fun to ride. Unloaded the Campeur is is a perfectly delightful commuter or something one might use for a nice day ride." "...the bike was clearly created by people who ride and, above all, respect the integration of form and function." 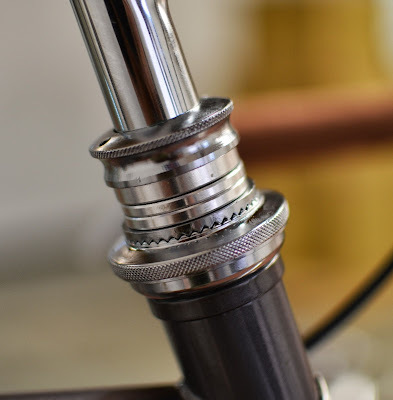 "The Velo Orange racks are exquisite and perfectly matched to the bike itself." "...were I forced to limit myself to a single bike, this may well be the leading candidate." It's one thing to read a positive review, but how much did the writer really like our bike? In this case a lot. After testing it Charles bought a VO Campeur for himself. By the way, Adventure Cyclist is a great magazine that's actually devoted to offering information related to cycle touring. It's a refreshing contrast to publications that are mostly devoted to selling as much of their advertiser's stuff as possible while providing little useful information. 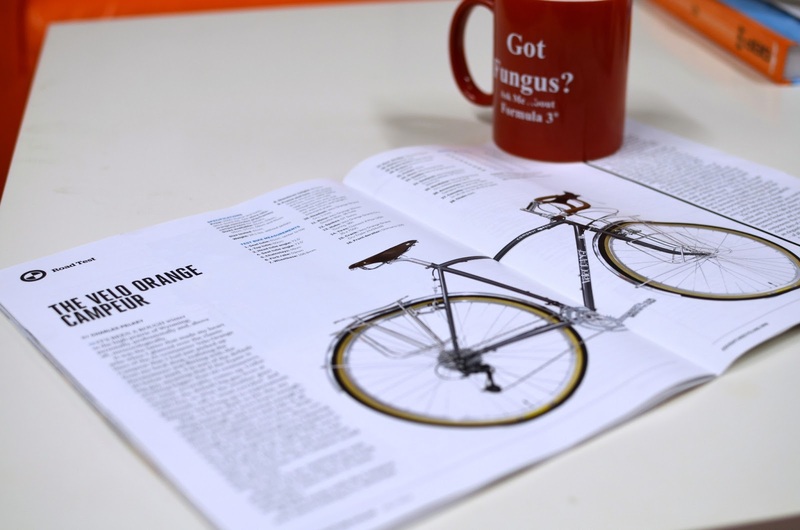 You'll need to join the Adventure Cycling Association to get the magazine, not a bad deal. UPDATE: The Adventure Cycling review of the Campeur is now on line. Sweating through our t-shirts, we have unloaded the container and we are putting things in stock as you read this. Oh yeah, we listened...check out this tall drink of water...63cm Campeur. 47cm and 49cm sizes are planned for the next production run. EDIT: You can find the geometry for the 63cm Campeur on our support page. It's July 1st so: Happy Canada Day! VO will be closed this Thursday and Friday, the 4th and 5th of July. Happy Independence Day! 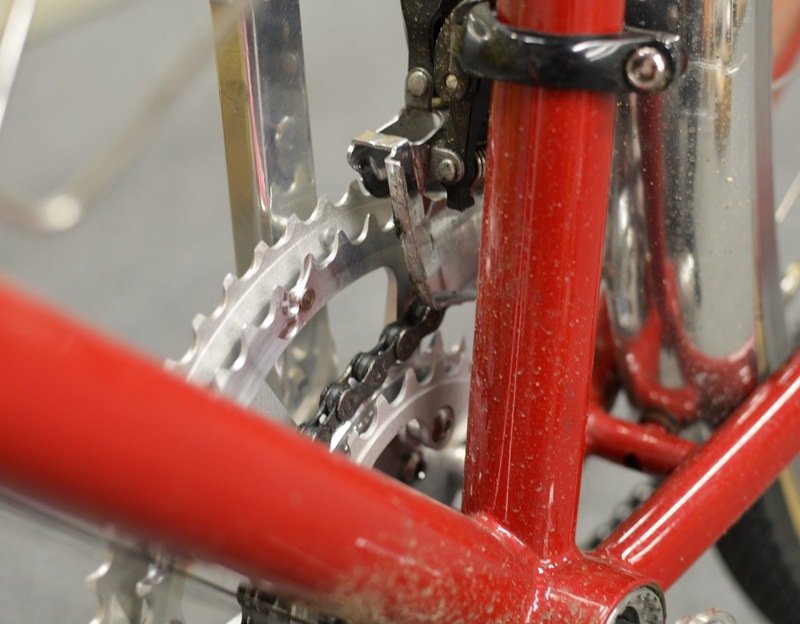 We have one "scratch-and-dent" Campeur frame available at $100 off the regular price. In a fit of silliness we decided to order some of our favorite camping hatchets. They are actually very nice. Another container containing, among other things, a large quantity of Campeur frames is due to arrive any day now.